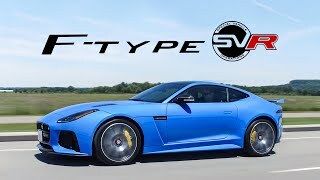 Jaguar F-Type SVR 2017 is another addition of the top class brand ‘JAGUAR’. It’s the addition of the one of the most proffered sportscars which not only won many prestigious awards but also helped others purist to believe and have their faith restored in the British Auto brand once again. The F-Type is definitely popular not only in the International market but Indian market as well at the same time. The SVR certainly looks more aggressive than other F-Type models. 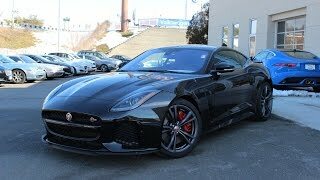 Let us have a close look at the reviews of the superior model Jaguar F-Type SVR 2017 and find out all the new stuffs incorporated to make it better than the other models. The interior of Jaguar F-Type SVR 2017 would be classy as the previous models. The info about the interior is yet not shared by the brand. We will love the driver focused cabin, as all the previous versions of the model hold. Yet it would be having multifunction three spoke steering wheel, the comfortable and contoured sports seats which are covered with plush leather, the well positioned controls layout everything would look well designed. Jaguar will definitely add some new elements as well to update the interior; this updated might include a new infotainment system with bigger central mounted display. 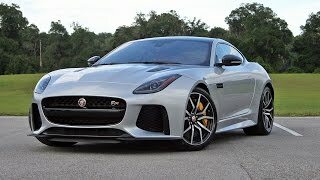 There is also a chance that Jaguar might upgrade the new F-Type’s sound system as well. Jaguar F-Type SVR 2017 will surely come with glamorous interior. Jaguar F-Type SVR 2017 comes with the one of the fantastic exteriors than the previous F-Type. It was Jaguar’s and still is one of the best looking sports car. The car pays tribute to the iconic E-Type and carries some of its styling cues as well. The front grille looks little smaller as compared to the previous generation car, but it still retains the same shape like the previous series car. The lower bumper also looks new. The headlamp gives the new character to the sports car. At the rear end, the taillamp looks updated which is a major attraction of the exterior styling. The centrally positioned exhaust gets two exhaust outlets which look better than the separately positioned unit. In addition there is a new rear wing which looks absolutely amazing and adds the major attraction to the sporty Jaguar F-Type SVR 2017. 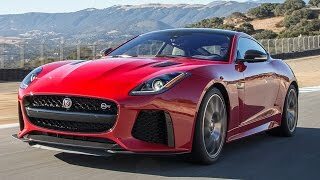 Jaguar F-Type SVR 2017 comes powered with the 3.0 Liter V6 unit. It offers about 340 Hp of peak power. All that power is sent to the rear wheels via the six-speed manual transmission while there is also an eight-speed automatic transmission as well which comes with paddle-shifters positioned behind the steering wheel. The peak power produced is 550 hp. The car can knock 0-62 mph in 5 seconds and can attain top speed of 174 mph. 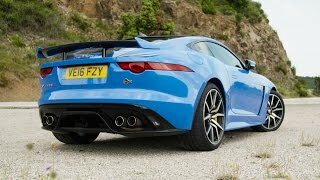 In all, Jaguar F-Type SVR 2017 is a powerful sporty beast.